The other day was a weird day. I woke up not feeling myself, was running late for work, saw a lad on the train who wasn't the nicest person in school, bumped into my ex, kept getting distracted in work, and just didn't feel right. So I decided to do a little retail therapy on my way home, and the girl who served me used to be my internet friend when I was about 14. We didn't acknowledge it, it was strange. 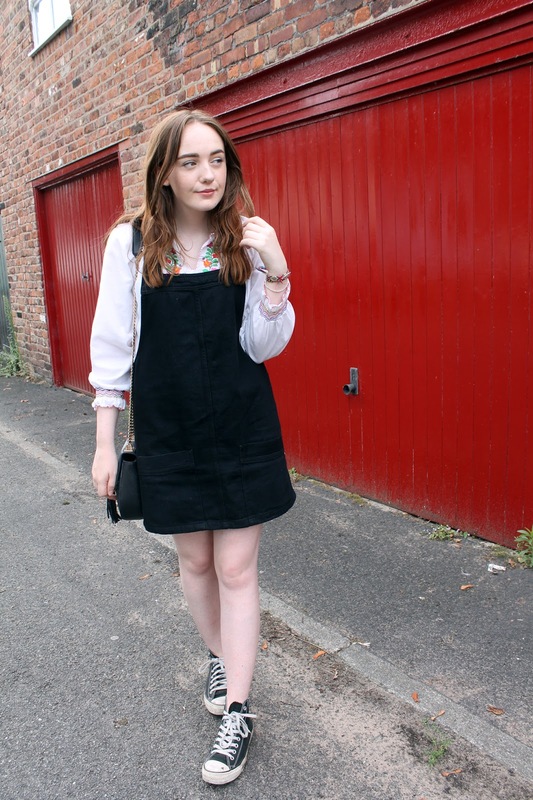 But one good thing to come out of that day was this Topshop pinafore. I feel weird saying pinafore, it's what I was forced to wear in primary school. A grey polyester thing with heart shaped buttons. But dungaree dress doesn't sound quite right to me. I also got a pretty red top in the Topshop sale, it's long sleeved, oversized and sits a little weird, but I like it. Side note: my best friend replied to my 'do I or don't I' snapchat with a resounding no. It was too late, I'd just handed my things over to the ex-internet friend at the till. I shared a picture of it on my Instagram, so you can decide for yourselves. The past week here in the UK has actually felt like summer, sometimes even a little too much. See this freckled skin? It was not built for 31 degree heat. But I have enjoyed getting to wear my skirts and dresses only reserved for the sun. 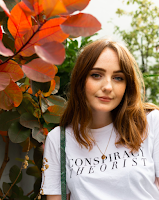 I feel like I'll get a lot of wear out of this Topshop pinafore, with a polo neck jumper and boots in winter or with this embroidered vintage top and classic converse in summer. 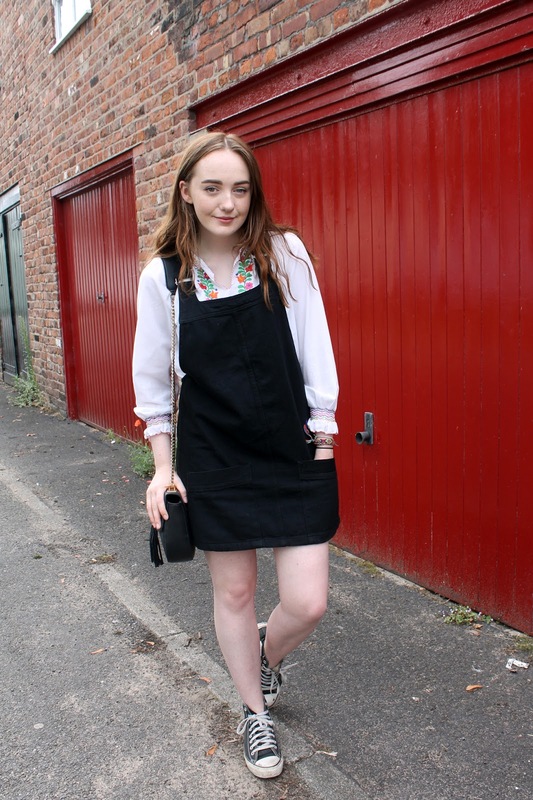 This Topshop pinafore was a recent purchase, but doesn't seem to be available online, check your local branch and fingers crossed you should find it! What are you wearing this summer? Hopefully we'll get some more good weather over the coming months, so I need more outfit inspiration, send it my way! I love your styling. That shirt looks amazing. 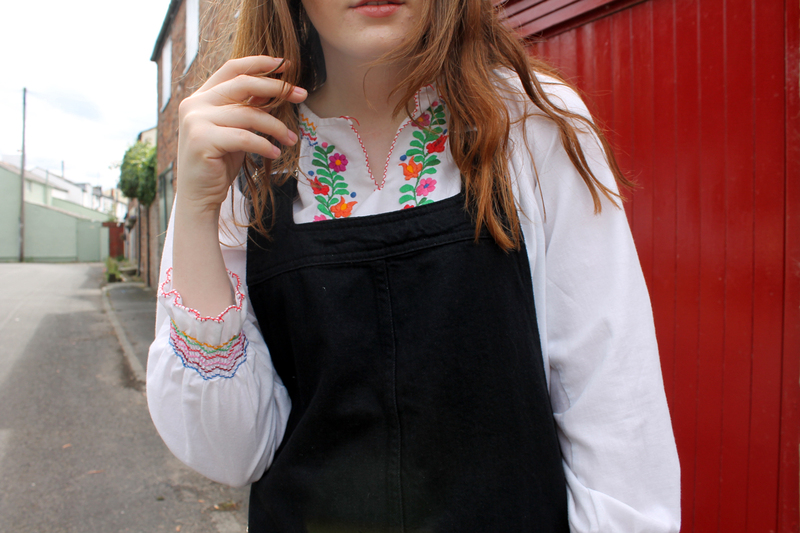 super cute, love the pinafore with that blouse!